Kudos to Polis di-Raja Malaysia (PDRM) for rounding up seven suspected terrorists who were planning attacks on houses of worship nationwide. “It is no easy task to keep one, two or more steps ahead of terrorists and their operatives or organisations,” Gerakan Deputy Speaker Syed Abdul Razak Alsagoff said. He said Malaysians should be relieved and thankful to their police for its continuous efficiency in the fight against terrorism. Syed Razak said the latest detention and arrests of terror suspects “is yet another testimony that terrorists are trying to make Malaysia their base of operation for Southeast Asia and Asia”. “The concern for public safety is thus natural. But what should be more worrying is about Malaysians being roped into terror cells. “We should even be be worried about Malaysians being brainwashed and influenced into providing support to terrorists and the spread of terrorism,” he added. 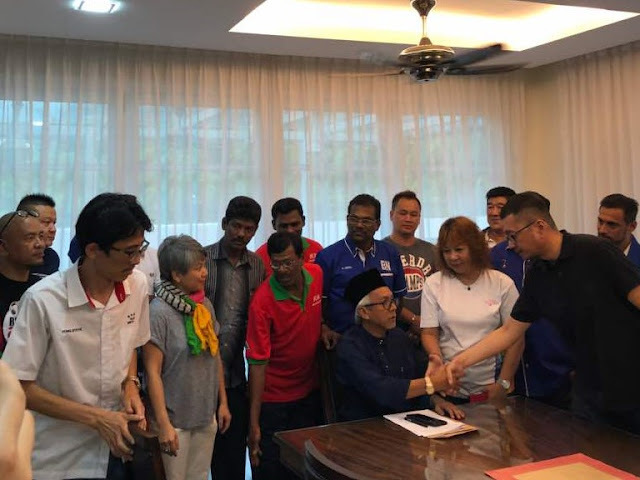 Syed Razak, who is Gerakan’s nominee to contest N.37 Bukit Lanjan in the coming 14th General Election (GE14), said “it is imperative that the governments and Malaysians treat the threat seriously and not take public security for granted”. “We must remain vigilant and wary of activities and propaganda that serve to divide Malaysians to destroy national unity. “We must seriously reject all individuals and organisations that promote extremism in whatever form, including those who continuously try to drive a wedge among Malaysians,” he added. 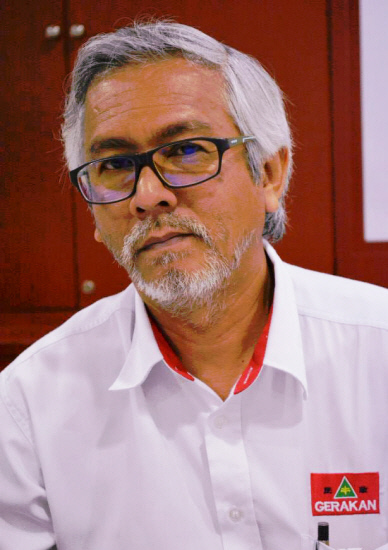 Syed Razak said Malaysians could not hope for Malaysia to remain harmonious, progressive and prosperous “if they do not outrightly reject extremism perpetuated by individuals and organisations and their supporters and associates”. “Malaysians can help the police to raise their efficiency even higher by reporting suspicious individuals and activities,” he added. KUALA LUMPUR: Seven suspected terrorists allegedly planning multiple attacks in the country have been detained in Sabah and Johor. The suspects were arrested by the Bukit Aman Special Branch Counter Terrorism Division in multiple operations held between Feb 27 and March 15. Six of the suspects arrested in Johor were members of an Islamic State (IS) cell and had planned attacks on non-Muslim houses of worship as well as the kidnapping and killing of police personnel. Inspector-General of Police Tan Sri Mohamad Fuzi Harun said the first series of arrests involved three suspects on Feb 27. "The second suspect is a 49-year-old security guard and adviser to the terror cell," he said adding that the suspect was in charge of keeping the cell and its plans secret. "He also threatened to kill any cell members who leaked the secrets. "The third suspect, a 30-year-old security guard, was tasked with acquiring firearms from a neighbouring country. "He also scouted several houses of worship targeted by the terror cell," he said in a statement on Saturday. Mohd Fuzi added that the suspects planned to escape to a neighbouring country and seek refuge from a terror group there after carrying out their plans. He said three other members of the same cell were detained in follow-up operations. "One of them – a 25-year-old waiter – was arrested on Feb 28 and we learnt that the mastermind had ordered him to kidnap and kill police personnel. "Two others, aged 23 and 22, were arrested on March 1 and were working as janitors in Singapore. One of them acted as the intermediary in the purchase of firearms for the cell," he said. The final arrest was of a 31-year-old Abu Sayyaf member in Sabah on March 15, added Mohamad Fuzi. "The Filipino man is a trusted lieutenant to Furuji Indama, the group's leader based in Basilan. 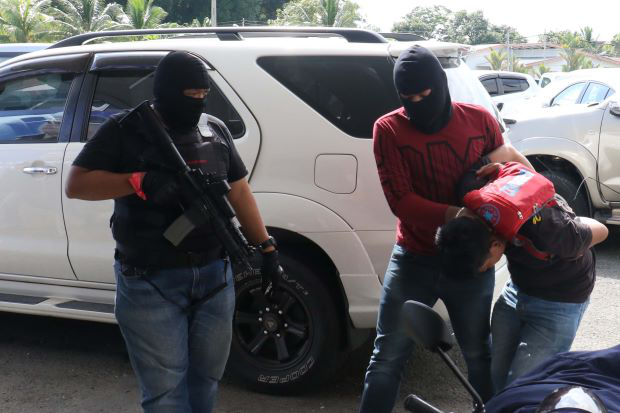 "We believe the suspect has connections to Malaysian militant Dr Mahmud Ahmad and is also wanted by Philippines' authorities for involvement in a kidnap-for-ransom syndicate," he said. He added that the suspect was an expert at making improvised explosive devices. "He also planned to attack several locations in Sabah and was entrusted to make the state a safe haven for terror groups from the Philippines," he said. One of the suspected militants detained in Sandakan on Jan 25. KUALA LUMPUR: Eleven people, including individuals arranging for the safe passage of militants to the southern Philippines, have been arrested for suspected links to the Islamic State (IS) terror group. The suspects — 10 men and a woman — were detained in Johor and Sabah between Jan 25 and Feb 6 by the police's counter terrorism division. The first series of arrests were made on Jan 25 and Jan 26 against five men — two Malaysians and three Philippine nationals aged between 33 and 50 — in Sandakan, Sabah. "Two of them were labourers, one an un-licensed moneylender, one a boat operator and another was jobless. "One of the suspects — a 39-year-old Filipino — was receiving orders from a senior IS leader in southern Philippines to arrange safe passage for militants from Sandakan to Zamboanga, where they would join the IS faction there," Inspector-General of Police Tan Sri Mohamad Fuzi Harun said in a statement on Wednesday. The same suspect also received weapons training in the southern Philippines and training from the terror group, he said. "The other four are believed to have assisted the main suspect in smuggling militants to the southern Philippines via Sandakan," he said. Mohamad Fuzi said the next series of arrests was against four individuals — two male Filipinos and a Malaysia woman aged between 27 and 32 — in Penampang, Sabah on Feb 4. "One of the suspects — a 27-year-old man — is a senior member of the Abu Sayyaf militant group, which is based in Basilan, while another one — a 32-year-old man — had helped a foreign militant make his way to the southern Philippines," he said. Follow-up operations led to the arrest of a 48-year-old Filipino man, who has Malaysian permanent-resident status, on Feb 6 in Sandakan. The country's top cop said the other arrest was of a 38-year-old Malaysian man who was deported to Malaysia on Feb 2 after being detained in Singapore on Jan 18. "The suspect, who is from Penang, is suspected of having planned to head to Syria to join the IS there. "He was arrested by Singaporean authorities on Jan 18 and was handed over to the counter terrorism division in Johor Baru on Feb 2," he said. Based on the arrests in Sabah, Mohamad Fuzi said it was learned that the Abu Sayyaf group was attempting to form a terror cell in Sabah so that they could successfully arrange for the safe passage of IS militants in the region to the southern Philippines. "The militants were to receive weapons training in the Philippines. "The same terror cell in Sabah would later have been used to launch attacks in the state," he said."